Welcome to Imprint Friday and today's featured imprint: Algonquin Books. Stop by each week to be introduced to a must-read title from one of my favorite imprints. I know you'll be adding many of these books to your wish list. I love immigrant stories, probably because I grew up hearing my grandfather's real-life stories of his own immigration to the United States. 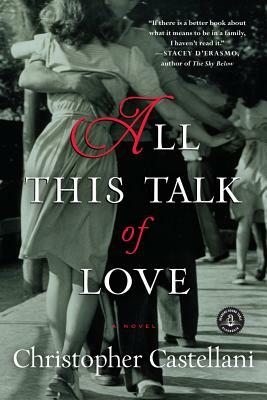 That's what first attracted me to Christopher Castellani's All This Talk of Love, but the vivid characters and multilayered plot are what held my attention. I want to start by saying that I was well into All This Talk of Love before I realized it was the third in a group (not a series or a trilogy in the normal use of those words) of novels about the Grasso family. I want to reassure readers that I never once felt lost; this book works well as a standalone story. At the same time, though, I am now eager to read the first two books and hope to revisit the Grasso family soon. As in any family, each Grasso has an opinion of the others and each has a distinct personality. Prima, the daughter, did what was expected of her: married a successful man, had four sons, and stayed near her parents. Frankie, a replacement child for the brother he never knew, is the opposite. He may talk to his mother every night at precisely 11:01, but he has no intention of returning to Delaware after he finishes graduate school. Never mind that he hasn't yet informed his mom of this. Then there are Maddalena and Antonio, who struggled to make something of themselves in the United States. Antonio may have embraced many of the stereotypes (he owns a restaurant that serves Italian food, for example), but his wife is as far from a Italian grandma as you can get. She's still beautiful, stylish, and thin in her seventies, and she doesn't cook. When Prima surprises her family with nonrefundable tickets to her parents' birthplace, she knows it'll likely be a hard sell, but she's unaware that she may have opened up doors that had been purposely and firmly closed. All This Talk of Love is a story of love, family, loss, aging, and facing the past. Christopher Castellani's characters are so realistic that it's sometimes difficult to remember that you're reading a novel. Not that every incident is one that could have happened to your own family, but the Grassos are believable as people. Is she right? Would her life really have been the same if she had spent the last fifty years in Italy? As the proposed trip looms large, family tragedies change the dynamics of the group: One is quick and one is slow, and each plays against earlier losses and sorrows to reshape a family already feeling the loosening of its traditional bonds. All This Talk of Love is recommended to readers who like family stories and realistic characters. In addition, Christopher Castellani brings up some points to ponder, such as the quote I just shared. Because of this, the novel would make an excellent book club selection. Readers will likely differ in their reactions to the later part of the book and perhaps to some of Frankie's choices. If those topics don't generate enough discussion, Algonquin provides ten thoughtful questions to jump-start your meeting. Algonquin Books is a featured imprint on Beth Fish Reads. For more information about the imprint, please read Executive Editor Chuck Adams's introductory letter, posted here on January 7, 2011. Don't forget to follow Algonquin on Twitter and Facebook and read their blog (where you can sign up for the Algonquin newsletter). sounds interesting ... thank you as always for the recco! I adore family stories, especially when they're realistic. This series sounds marvelous! I think these sound wonderful. Thanks for bringing them to my attention. Sounds Loki a good one even without the (2) previous ones. I didn't realize this was a third in a series, so thanks for the heads up. I've just had a couple of not the best experiences trying to jump into the middle of an established story. I'm reluctant to do that again bc I'm always afraid I won't give the book a fair shake. Still, I'm looking forward to this one. I love immigrant stories too. There's something so brave in those stories. A perfect book for my Immigrant Stories Challenge! It sounds excellent - thanks for the review! I absolutely loved this story. I am a third generation Italian and yes, it felt like my own family. The comment "close the light" is right out of my grandmother's mouth. I also read the first two books in the series and didn't realize when I received this book to review that it was part of THIS series. I was thrilled to visit this family again.